No month about lunch would be complete without sharing a recipe for summer rolls. Easy to make, once you get the wrapping part down, they can be made with unlimited ingredients. Wrap the finished rolls in a damp towel, stick in an airtight container, and be on your way. 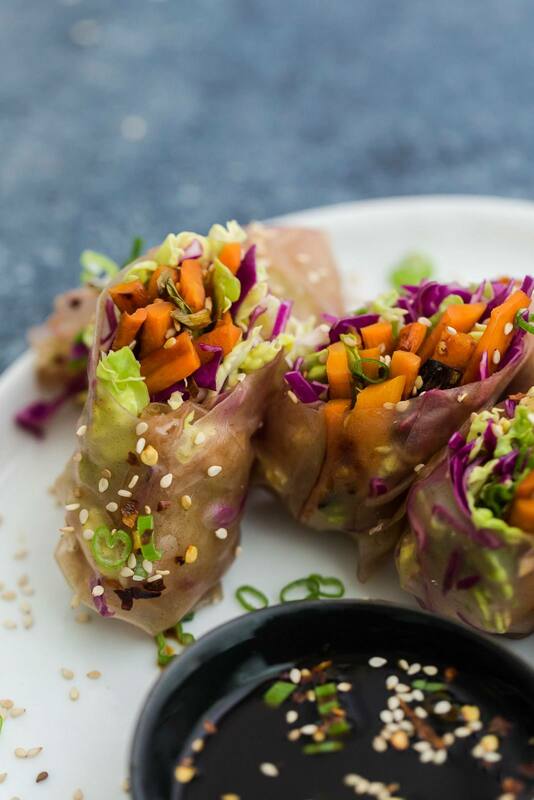 I’m usually tossing raw ingredients into rolls but these carrot summer rolls are one of my favorite. The carrots have such a great sweetness that goes well with the crisp cabbage. In a small skillet, add sesame seeds and lightly toast for 4-5 minutes. Combine toasted sesame seeds with honey, olive oil, soy sauce, and garlic. 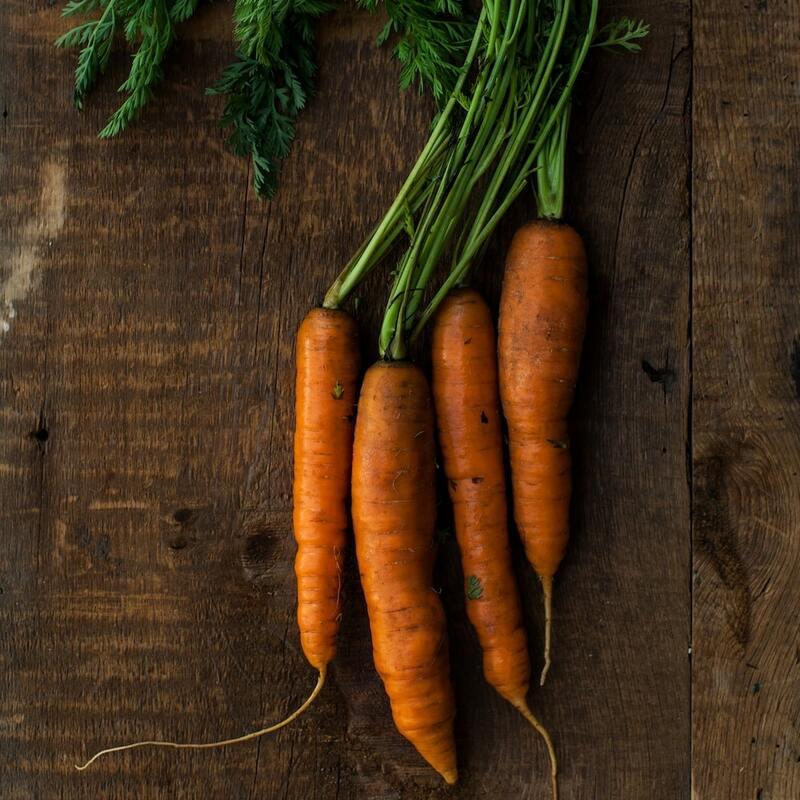 Slice carrots and green onions into 2 inch long, 1/4″ thick pieces. Toss with tamari mixture and place in a baking dish. Roast carrots for 30-45 minutes until carrots are soft and browned. 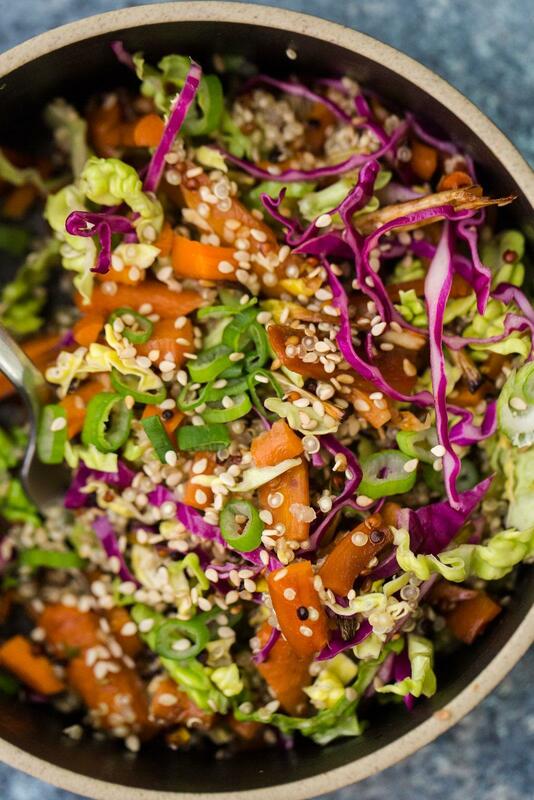 In a small bowl, toss the cabbage with rice vinegar and sesame oil. Set aside. Set up your spring roll rolling station with the warm/hot water, roasted carrots, cabbage mixture, and a place to roll/cut each spring roll. Soak the rice paper for 10-15 seconds (you don’t want it too soft when taking it out of the water, it will soften as you add filling.) 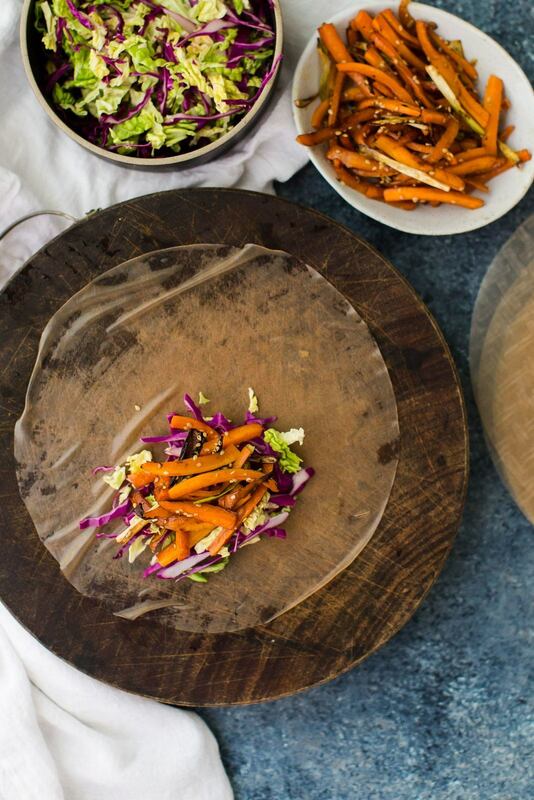 Place rice paper on a cutting board and load with greens/rice noodles and carrots. Roll, tuck, and fold in sides as you go. Continue with remaining ingredients. Once done slice in half and serve with a little bowl of tamari. Greens/Noodles: I originally made these with a mixture of asian greens but found the crispness of the cabbage to work even better. Spinach or Chard would well. Also, I occasionally use rice noodles in place of or in addition to the greens. Vegetables: Carrots are my first choice but during the cooler months parsnips, rutabagas, or even sweet potatoes would work well. Adjust the cooking times as needed. Vegan: This is super easy to make vegan: leave out the honey or swap in your favorite vegan-friendly sweetener. || First posted on March 28th, 2012. Last updated on February 16th, 2016. First, I love your examples of Bachlorettehood. I do every one of them, except the Mad Men marathon – I just haven’t gotten into that show. I do plenty of other marathons, though. I think the most recent was Downton Abbey, and the next is probably going to be Sliders. This is so unique! 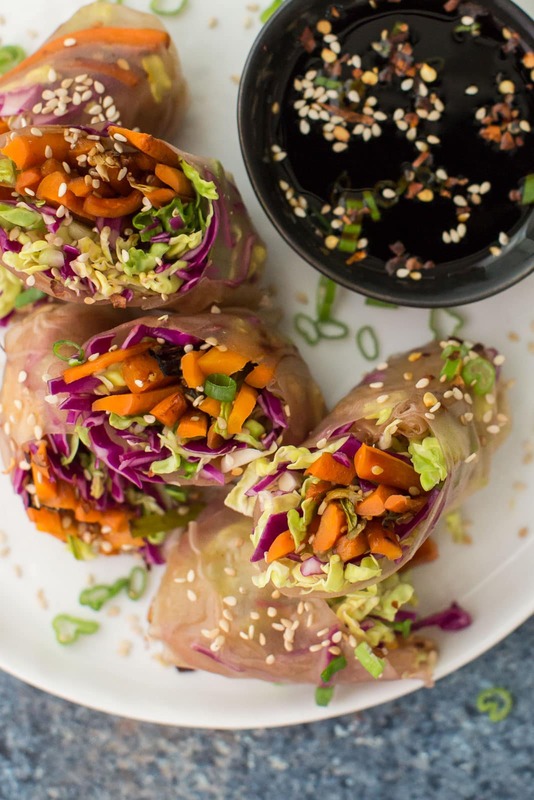 What a fun way to switch up spring rolls! Yum! What a great idea for using your greens and carrots, looks delish! I’m getting carrots in my csa today and I was just trying to decide what to do with them! Great idea for spring veggies! I love spring rolls too but didn’t experiment on the rice paper ones until you posted a spring roll recipe a couple weeks ago. I roasted some shredded carrots and brussel sprouts with some cumin… but I love your soy marinade, this is so flavorful I am sure! Will have to try it next time I bust out my leftover rice paper rolls from a couple weeks ago. How do you keep your opened package of rice papers? In the refrigerator, pantry, or freezer? In the pantry! I’ve never had trouble storing them before! Peanut sauce is my favorite and it’s so easy to whip up! these look so beautiful! Almost too beautiful to eat! Glad you’re embracing bachelorette-dom 🙂 Sometimes it’s sooo great to just worry about yourself, I’m experiencing this myself. Umm yeah, can we add to that list “waking up at 6AM to blog every morning (even on weekends)”, “sleeping with cookbooks next to your bed” and “eating peanut butter out of the jar”. Cause I think those are pretty much single lady things also. 😛 And I do them. I am never going to share my coffee. Ever. I might not share these spring rolls either. It’s debatable. I love spring rolls – these look so fresh and delicious. Great idea to roast the carrots in soy sauce! do you find them sustaining enough for lunch without any noodles or tofu? I usually pack a salad with some legumes as a side but if you’re wanting these by themselves- I would add tofu! I love spring/summer rolls and have attempted to make them at home several times. While delicious, they always come out so ugly and messy! Even with practice, they haven’t gotten any better. Any suggestions for better rolls? This was awesome! Great flavors, simple, delicious. I didn’t have wraps, but I did have some rice noodles for Pad Thai. So I just mixed the vegetables with the noodles and I it was SO good. Someday will try making rolls.